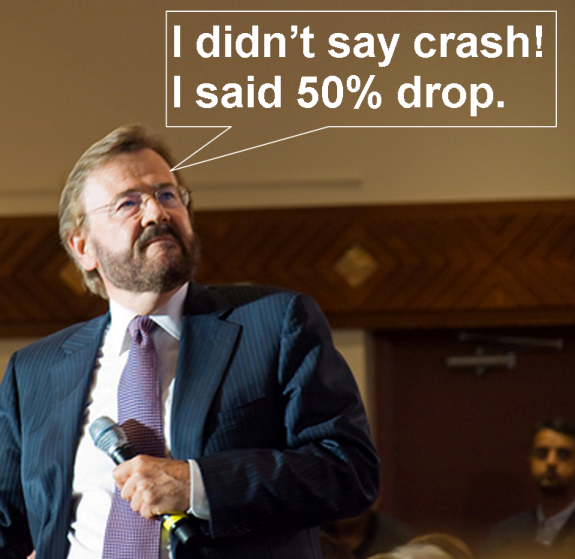 Would a 50% drop constitute a crash? In this context, Garth probably meant 3-6 months when he said soon. The median price is up $30,000, or 7.1% since he said that. I doubt that we’ll see any references to that prediction by Garth on his blog. This entry was posted in Greater Fool, Predictions. Bookmark the permalink. May is turning out to be a very interesting month for Calgary’s housing market. A month that could set price records once again. So far in May, average prices for single-family homes are in striking distance of a new record. According to the Calgary Real Estate Board, month-to-date until May 26, the average MLS sale price for a single-family home in the city is $521,633, up 3.65 per cent from the same period a year ago. The record average sale price was set in February this year at $518,452. The city’s total MLS average sale price – which includes all properties – is also within striking distance of an all-time record this month. Month-to-date, the average sale price for all properties in the city is $459, 951 just off the all-time record of $460,766 which was established in March of this year. The average sale price this month is also up 3.26 per cent from the same period a year ago. Bond yeilds are up, mortgage rates will follow. It doesn’t matter what the BOC does. The markets rule. Personally, the amount of money that is flowing into equities, and the lack of interest in bonds is going to drive yeilds higher, not to mention the view that Canada is becoming riskier to invest in (do in part to the inflated housing market and high, high debt). Yields are rising and will continue to rise, and mortgage rates will rise with the yeilds. There is nothing the BOC can do. They could take the benchmark negative, still will not help.